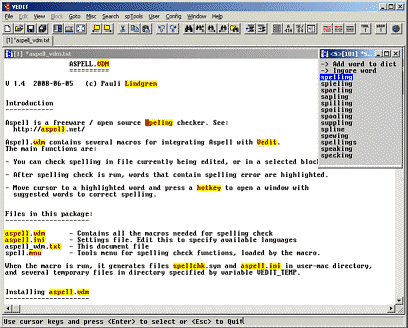 This free package integrates GNU Aspell spelling checker with Vedit text editor. To install Aspell.vdm, just unzip the files into your user-mac directory. You can start using it immediately, no other installing steps are required. (You need to have the GNU Aspell spelling checker installed in your system, of course.) To make it easier to call aspell.vdm, you can add the call in your User or Tools menu, and optionally configure a hot-key to it (see aspell_vdm.txt for details). You can check spelling on the whole text file currently being edited, or you can highlight a block to check spelling within that block only. Start aspell.vdm by clicking "Check spelling" in your User or Tools menu (if you have added that option), or select "Misc" -> "Load/exec user macro" and then select aspell.vdm. When you start aspell.vdm, the main dialog is displayed for selecting the options. 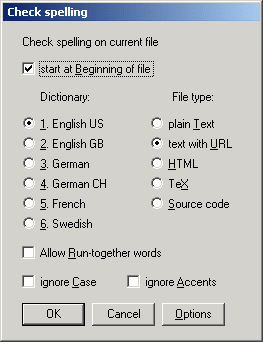 You can choose the language, depending on which dictionaries you have installed for Aspell. Aspell.vdm tries to detect the language automatically and sets the radio button accordingly, but you can change that manually. File type setting selects Aspell filtering options. If you select for example HTML, then words inside HTML tags are not checked for spelling. The default setting is selected according to the filename extension. New:The file type "Code"allows you to check comments and strings in program source code. The comment delimiters are automatically fetched from currently active syntax file. Click OK to run Aspell. 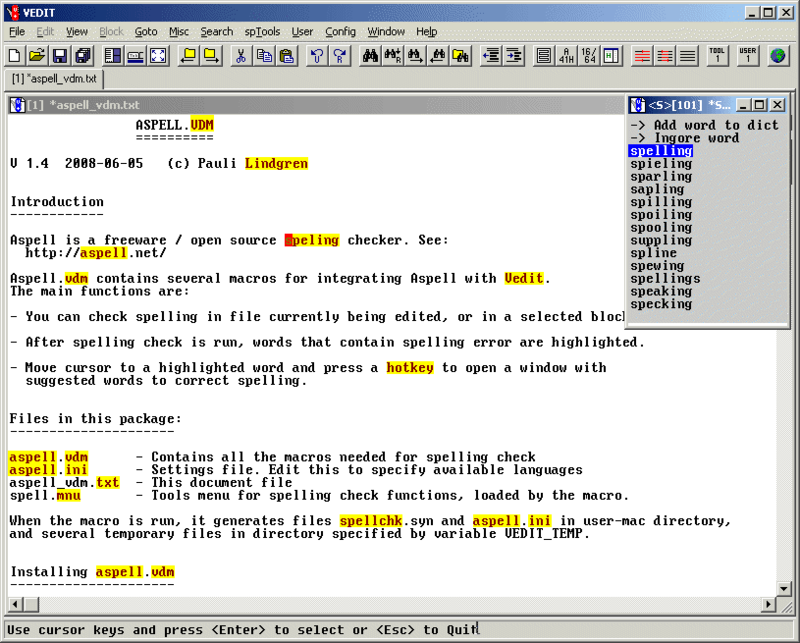 After Aspell has been run, the words with spelling error are displayed highlighted (by default with yellow background). Words with suggestions are displayed in black color, words with no suggestions are displayed with red color. See the screen-shot below (click for full size image). The Tools menu is now replaced with spTools menu, and shortcut keys to the menu have been defined. From this menu, you can select spelling checker functions. You can move cursor to one of the highlighted words that contain spelling error by using the Next error and Previous error menu options, or the associated hotkeys. To ask for suggested correction for a spelling error, move cursor on a highlighted word and press Shift-F6 (or select "Suggest correction for word at cursor" from spTools menu). A window opens with a list of suggested corrections, the most probable word first. Use cursor up/down, PageUp, PageDown, Home, and End keys to navigate in this list, then press Enter to replace the error word with the selected word. Or you can choose an option to ignore the word, or to add the word to your user dictionary. To cancel, press Esc, Space or Shift-F6. If you do manual changes in the text, you may want to check spelling again. Select "Check spelling" to run spelling checker again (by default, starting from cursor location). Or select "check Word / block" to check instantly without showing the dialog box. In this case, if a block is highlighted, that block is checked, else only the word on which the cursor is located is checked. After you have finished checking the spelling, select "exit spelling check mode" from the spTools menu. This restores your normal Tools menu and removes the spelling error highlights. You can change the configuration options of aspell.vdm from Options dialog. To open the dialog, click the [ Options ] button in the main dialog. From the Options dialog, you can choose the colors used for highlighting errors, limit the number of lines to check and max errors to find, and select if you want aspell.vdm to automatically detect the language and automatically move to next error after selecting an option from Suggest list. Pressing the [ Edit aspell.ini ] button opens aspell.ini file. Edit this file to choose which languages (dictionaries) are displayed as options in the main dialog. Each "lang=" entry must contain the Aspell language code (which is the name of .multi dictionary for that language), followed by the text you want to appear in the dialog box for that language.